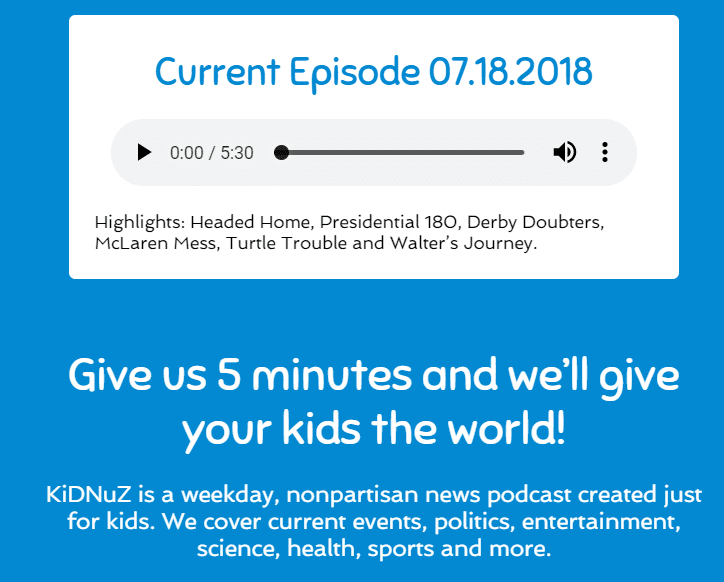 KiDNuZ is a weekday, nonpartisan news podcast created just for kids. We cover current events, politics, entertainment, science, health, sports and more. KiDNuZ is the brainchild of four broadcast journalists who have nine Emmys and 12 children between them. After years of producing, reporting and anchoring news for adults, they realized that kids deserve a newscast all their own. The result is a worldly wake-up that is long enough to engage but short enough not to bore. KiDNuZ is a great way to start the day. Play it at breakfast or in the car to get your kids “in the know” and asking questions on the way to summer camp, school or wherever life takes them. KiDNuZ, the first daily news podcast created just for kids, is free and online now at kidnuz.com. This entry was posted in For Teens, Mentors4Teens, Mind, Parenting Teens and tagged Parenting Teens. Bookmark the permalink.